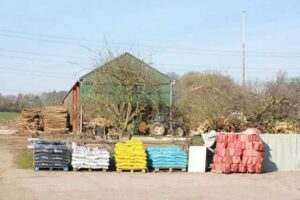 At the Woodshed we provide friendly home delivery of seasoned logs and firewood supplies in Wimborne and across Dorset. We provide a year round service for orders and deliveries and deliver 6 days a week. Please call us to arrange a time. *Distances are calculated using AA Route Planner. Taking orders for home deliveries from April onwards and throughout the Spring & Summer. Double load (x 3.2 cubic metres of loose logs) £10.00 discount. Triple load (x 4.8 cubic metres of loose logs) £20.00 discount. The standard log size is between 8 and 10 inches. The long size log is 12 to 14 inches. Should you require a special length, we are happy to cut them for a small additional charge.